Seeding equipment manufacturer Flexi-Coil has announced the release of its new 60 series air carts which the company says has been designed from the ground up and will replace the 40 and 50 series. Flexi-Coil's new 60 series air carts have been designed from the ground up to replace the existing 40 and 50 series. 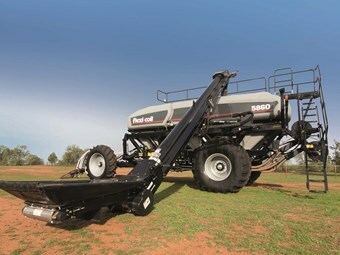 Flexi-Coil says the 60 series, which features seven models with capacities ranging from 12,234-litres to 33,477-litres, is ideal for broadacre farmers growing cereals, legumes and oil seeds. Flexi-Coil Australia’s brand leader Steve Mulder says the new range sets a new standard for accurate, reliable air seeding and includes a number of patent-pending features. "An Australian trial of one of the larger models in the new range, the 20,440-litre 5860 air cart, was held during the past few months," he says. "Participants were impressed with the ease of use and new in-cab monitor interface, as well as the quick-fill conveyor." Mulder adds the 5860’s simple variable rate application and section control makes the unit ideal for large broadcare farmers who need more efficiency and productivity from their seeding equipment. "The new 60 series’ distribution system delivers seed and fertiliser more accurately and its gentle handling system causes less damage to seed," Mulder says. "The bottom line is better seed germination." Among the new features of the Flexi-Coil 60 series include the FlexRate sectional control, which allows the operator to individually control up to 10 sections of the implement from the tractor cab via the Flex Control IV touchscreen. Flexi-Coil says this gives the operator greater application accuracy and less chance of double applications of seed and fertiliser. Each metering system is operated by an independent patented, 24-volt electric drive motor with integrated controls. With the FlexRate modular metering system, operators can apply fertiliser and seed in single or double-shoot applications. "The FlexRate system is easy to use and it gives you great flexibility," Mulder says. "You can utilise preloaded prescription maps using the task controller and a GPS input." The 5860 air cart is 5.62m wide and features four tanks, including a 881-litre small seeds tank. The generous capacity means operators can get the job done quicker with fewer stops. It comes with standard bin level and tank pressure sensors with alarms, and four in-tank and rear-view cameras. A fast-fill conveyor with remote control and a pneumatic fill system for the small seed tank ensure quick, efficient filling. "The remote controlled conveyor works extremely well. It is user–friendly and makes filling quick and easy, so you get maximum productivity out of it," Mulder says. The large tank openings, low-profile lids, offset platform and folding staircase enable fast access for easy filling and emptying. The adjustable seeders provide advanced monitoring and sensors to maintain productivity. Product rates can be set and varied from the tractor cab. The 5860 is available in tow-between or tow-behind configurations which Flexi-Coil says provide superior floatation and stability in all terrains. The quad wheel configuration with front steerable axle is standard on the 5860 tow-behind model. Flexi-Coil will officially launch its 60 series air carts at the upcoming Henty Machinery Field Days, to be held from September 22 to 24 in Henty, New South Wales. The range will also be displayed at the Yorke Peninsula Field Days in Paskeville, South Australia which is set to run from September 29 to October 1. Flexi-Coil says the new machines will be in Australia for demonstrations in 2016 and available for seeding in 2017. Flexi-Coil’s air carts are supported by a network of 50 dealers across the country.